The following is a guest post about life insurance. If interested in submitting a guest post please read my guest post policy and then contact me. Without adequate life insurance coverage, your family could be left with a huge financial burden if you were to unexpectedly pass away. 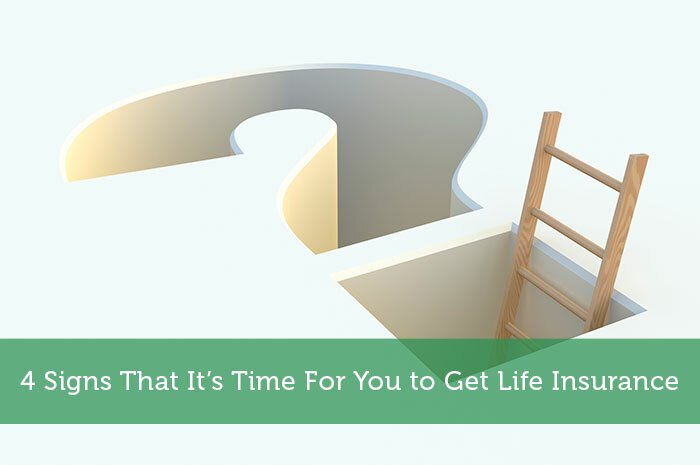 We’ve compiled four guideposts to help you know when it’s time to get life insurance. As a millennial, I don’t often find myself thinking about life insurance, or insurance in general for that matter. Nonetheless, life insuranceis one of the most important elements in your financial portfolio – it protects your family’s future well-being in the unfortunate case of an unexpected death. If you already know you need life insurance, but find yourself overwhelmed by the complexities of this financial product, Sureify is a great place to get straightforward information. You can learn about the basics of life insurance and get a free personalized life insurance plan. For those of you who are on the fence about or are unsure when to get life insurance, read on. If you’re like me, you haven’t had to worry about kids or a wife (referred to as dependents) for the past 25 years. But of course this changes when you get married or have children. Amidst all of the changes that come with new life stages – home address, last name, medical insurance, updated driver’s license, car seat purchases, etc. it’s easy to neglect life insurance, but without adequate life insurance all of these exciting new life events are put at risk. Without additional financial help, it would be difficult if not impossible for your spouse to pay off the mortgage of your new home or put your newborn child through college someday. Additionally, the more kids you have, the more coverage that you need (if you thought diapers were expensive, wait for college tuition). Protect your family and their way of life by getting adequate life insurance coverage. If you recently got a big promotion or new source of income and your new income allows your family to enjoy a certain lifestyle, you should increase your life insurance coverage to reflect the income that enables that lifestyle (as opposed to the more humble income/lifestyle when the policy was purchased). Don’t be afraid to increase your coverage, most policies allow you to do this relatively easily and if you go with term life insurance it won’t break the bank either (usually just a couple hundred dollars more per year). You can also check to see if your employer offers life insurance, as this can be a less expensive way of increasing your life insurance coverage. This one is pretty self explanatory, but if people depend on your income (even if you aren’t the head of household) every month – it’s wise to consider purchasing life insurance. Dependents could be your parents, a sibling, or even a friend that is on hard times that you support. Life insurance beneficiaries can be almost anyone of your choosing, it doesn’t just have to be your immediate family. If you’re a brilliant financial wizard like some folks on Modest Money, then you probably already know to use your birthday as a reminder to check out your financial portfolio and make necessary adjustments. If you are not yet a financial wizard, take this one super-simple step to master your portfolio: every year, the day before your birthday, check your financial portfolio and make any necessary adjustments. This is also a perfect time to assess your current life insurance coverage based on any changes in the past year. If you had a child, a major change in household income, or bought a home, use this time to reevaluate your current life insurance coverage. Remember that life insurance is a tool to protect your family financially in the unfortunate event that you pass away unexpectedly. Use these items as checkpoints for when it is wise to review your life insurance coverage. If you aren’t sure about what life insurance options are available to you, want a second opinion, or are unsure where to start, check out Sureify. They will help you learn about your options, estimate the amount of life insurance coverage that you need, and compare policy types – and you can download your personalized life insurance plan for free. When was the last time you checked on your life insurance coverage? Author Bio: Chris is a co-founder and head of marketing at Sureify. Sureify is a life insurance education platform for millennials where consumers can learn about their life insurance options, estimate their coverage needs, compare policy types and walk away with a free, personalized life insurance plan so that they’re equipped to buy with confidence. Sureify is devoted to providing consumers with unbiased, third-party education and resources on life insurance before they buy – no sales, just knowledge to empower them. I only have life insurance through work right now and even though it only covers one year salary, I haven’t purchased more because I don’t have any dependents yet. Once I get married and have kids I’m planning on getting an umbrella policy or term life insurance to cover the rest. Thanks for the comment Aldo, that’s good that you’re aware that you have some term coverage from work – a lot of people aren’t aware of that. I am saving now for my life insurance for about 3 months already. And I can relate my experience with your 1st sign. I totally agree with it. You have a good point. This is a great article. I hope it shows a few people that life insurance is important and that there comes a point where you need to get it. Many people also decide life insurance may be right for them after losing someone who was close to them, for instance, if a relative passes away. I read recently that many people choose not to buy life insurance because they think it costs too much, but they actually over-estimate the cost of life insurance by 2-3 times what it really costs. If more people were educated on the real cost and benefits of life insurance they may find it is a good idea to make it a part of their financial plan. Thanks for the input Hadley – term life insurance can definitely be an affordable option, particularly with new couples. I agree that in some cases getting a life insurance is a must, but not everyone can afford to buy one. I suggest you only buy it when you have a disease or you are old and you are at risk of passing away. Otherwise, why would you spend a lot of money in it? By then it’s too late! You don’t wait til you need it to get it, you’ll likely be declined if you have health issues, or the taking would be so high as to make it unaffordable. Don’t do that. Buy it when you’re healthy so it will be there when you need it. Like car insurance you don’t wait til you’ve had an accident to get it. That’s how insurance works. Thanks for the reply Mike. Agreed, if you’re sick or older you may be considered un-insurable and won’t have an opportunity to purchase life insurnace when you really need it. We highly advise all of our clients to purchase a life insurance policy. I’m not sure that budgetor.com is right in their comment here. Sure, it makes sense to have life insurance under those circumstances but it also costs a lot more when you inform the provider of your illness. Not to mention, how do you know you won’t be in an accident of some type that can shorten your life without an illness. Just my two cents. Good point Jim, completely agree. Thanks for your comment. Great article, i think what some people also tend to forget is that if you’re finding it hard to afford life insurance then its best that you do whatever it takes to get one, the last thing your family can afford at that point is the loss of a breadwinner. I completely agree with this post, but can you be over-insured? My husband and I both have Term Life Insurance policies – and then discovered our parents had taken out Whole Life policies for both of us in the late 80’s-early 90’s (when we were kids). While my adviser said they “don’t conflict” – are they both necessary? Are there benefits to canceling or keeping them both?